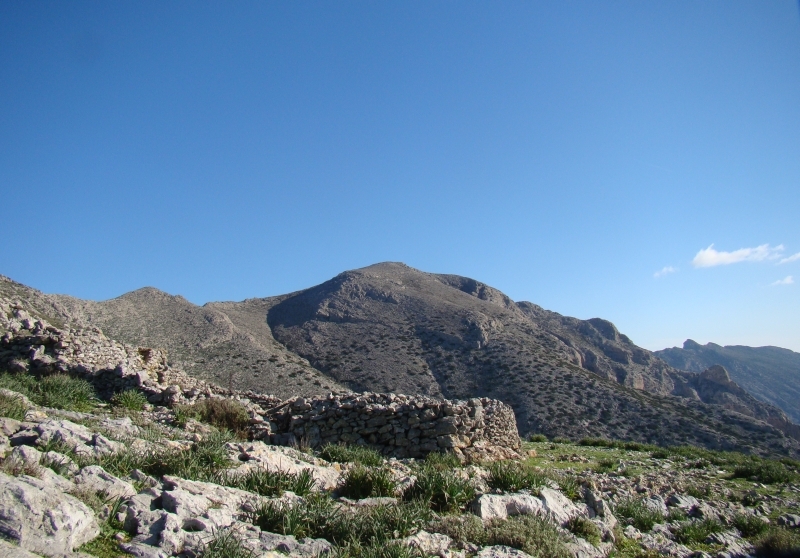 Krikelos range is the highest area of Amorgos. There are various ways to the top but walk 2 takes you initially along very well maintained paths. These paths become less well defined towards the summit. There are excellent views all the way up but the very peak is fairly flat so very little of the island can be seen but surrounding islands are visible. The summit of the Krikelos range is called Chorafakia and is 823 m above sea level. The area above Langada, below the Krikelos mountains, was heavily forested with juniper, oak and cypress, and in the 1800’s Aegiali was known as Melania after the Greek word for black or dark as the forest looked like a bruise or dark stain when viewed from the sea. Much wood was exported to the surrounding islands, particularly Santorini. In 1835 the forest burnt down in a fire that lasted 20 days and, due to soil erosion and grazing by goats, it never regenerated. In ancient times the shepherds in this area worshipped Pan, the god of shepherds and flocks, the shepherds using pipes to send warning signals and for playing music. In this area is also found the monastery of Saint John Theologos built in 530AD on the site of an ancient temple dedicated to Pan. Stones from the original temple were used in its construction along with volcanic stone from Milos. Take the date from the plinth and divide by 15. The cache is that number of metres towards Thira.